Frank DeFord definitely has nothing to worry about from me. 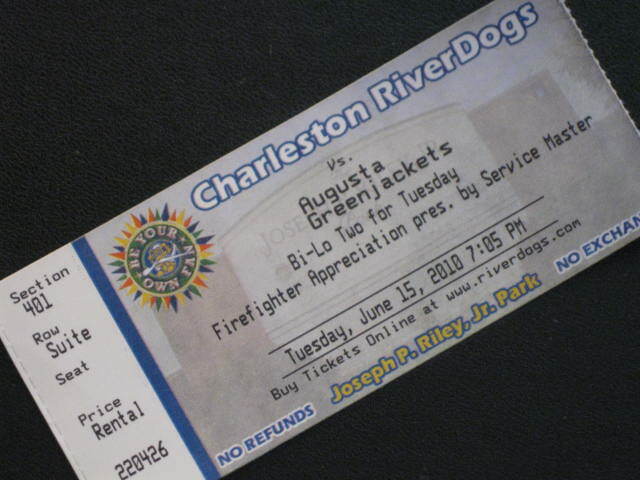 Still, I had a crapload of fun summarizing my first Charleston RiverDogs experience for PremiereCharleston.com. As Tom Hanks once declared, there is no crying in baseball. In Charleston, however, there is sweating. There’s a lot of sweating, and not just in the cheap seats. Even non-VIPs like me who somehow scored a spot in the air-conditioned luxury box were gripped by the Sweaty Fist of Oppression™. Please take a look at my latest blog post, Panting Like a RiverDog. Until next time, this is the old left-hander, rounding third and heading for home! Dateline: Kiawah Beach, SC. Moms and dads sizzle in the sun. Diaper-butted babies splash in tidal pools. 10-year-old boys wipe out spectacularly on boogie boards. People of all shapes and sizes bob in the waves. Farther out, the occasional dolphin fin breaches the surface, and pelicans do that insane kamikaze dive of theirs. Out on the misty horizon, a half-dozen shrimp boats ply their trade, harassed by squadrons of gulls. It’s weird to imagine the possibility of this all simply going away. Read the rest of Charleston’s Coastal Beauty and Diversity HERE. Well, the dumb-guy’s perspective on e-commerce draws to a close this week. Four parts, five weeks and 4300 words later, we come to the stirring conclusion: e-commerce is good…so, like, do it! So, just for the sake of completeness, here is the entire four-part series in its entire entirety. Enjoy, e-geeks!